Few patterns are so appealing as this series of baby outfits made in Marble by Kertzer! Colors change automatically with this easy to use acrylic yarn. 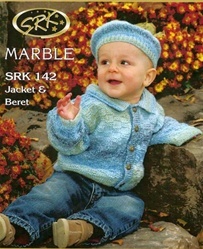 Four sizes 0-3mos (3-6m, 6-12m,12-24m) take only 3 skeins, any size. Don't forget some cute buttons!